Memories made on board a cruise ship last a lifetime. An extraordinary dinner or bank-breaking spa experience goes one step further. Here are seven unforgettable cruise ship splurges that will take your vacation to another level. Go on big spender, you deserve it. If a spa treatment utilizing 24-karat gold on your face doesn't sound like a splurge, it's hard to imagine what will. 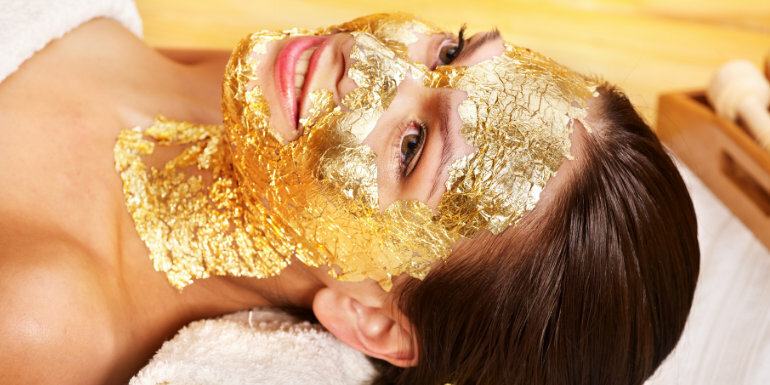 Seabourn's aestheticians apply the precious metal in thin sheets of gold leaf, creating a mask that draws out toxins while tightening and smoothing skin. The gold's magnetic properties are said to speed up cell renewal, too, but we're not entirely sure that's the point. 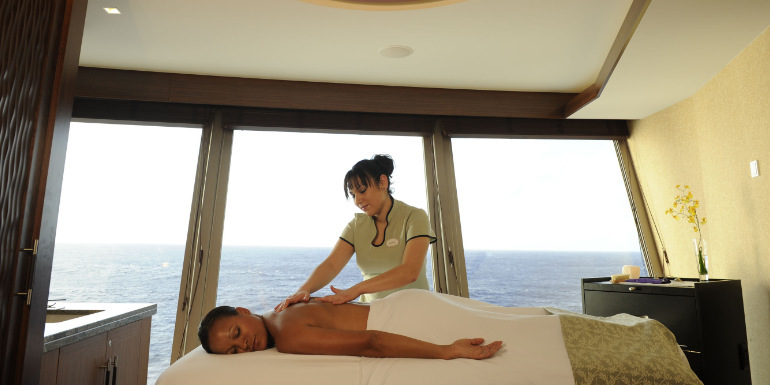 With Princess Cruises' launch of Royal Princess came a regal offering: the Royal Indulgence spa package. This lavish treat for four includes a full day of pampering inside a private Lotus Spa cabana within the exclusive, top-deck Sanctuary (a spa-inspired outdoor terrace). In addition to Lotus Spa cabana's plush loungers, butler service, picnic baskets stuffed with gourmet snacks, wines and other decadent delectables are all the massages, facials, and hot-stone therapies you can squeeze into 12 hours of bliss. Gilding the lily are caviar and a bottle of Dom Perignon. Make your way to the front of the cruise ship, where the MSC Yacht Club's swank suites cluster on the foredeck. 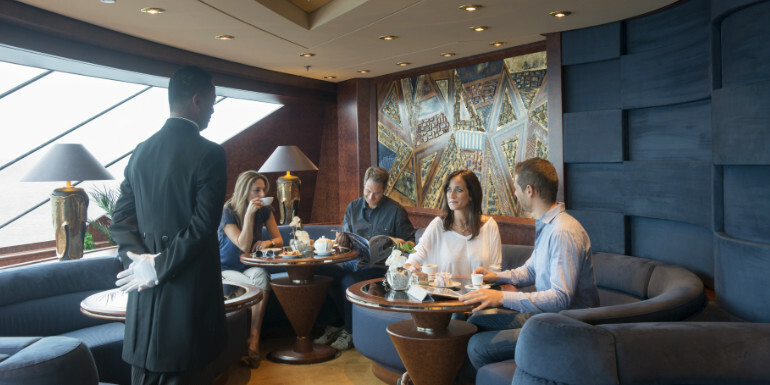 An elite enclave with its own concierge, lounge, restaurant, swimming pool with whirlpools, solarium, and chaise lounges, the MSC Yacht Club lets guests get away from the bustle of crowded buffets and lido decks. 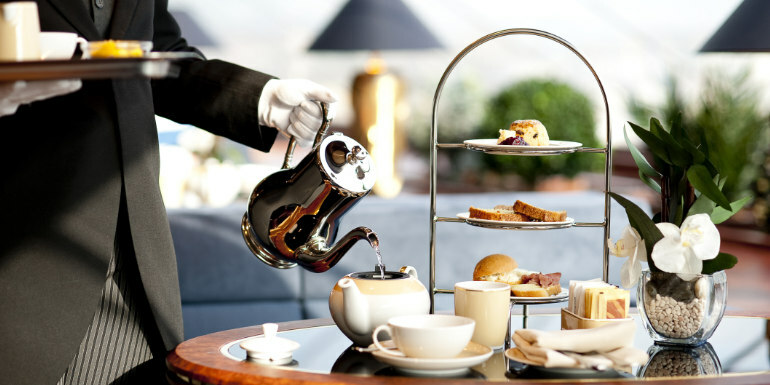 Here wine, beer and espresso drinks, plus small plates and sweets are complimentary, butler service is 24/7, and a traditional high tea is served daily in the lounge. It's a quiet microcosm of a cruise – a ship within a ship. Average cost: From $2,129 per person for a seven-day Mediterranean cruise. Consider this two-floor suite the antithesis of an inside stateroom, replete with the finest furnishings, a baby grand piano, a private, open-air whirlpool and a wraparound balcony with plush furniture. 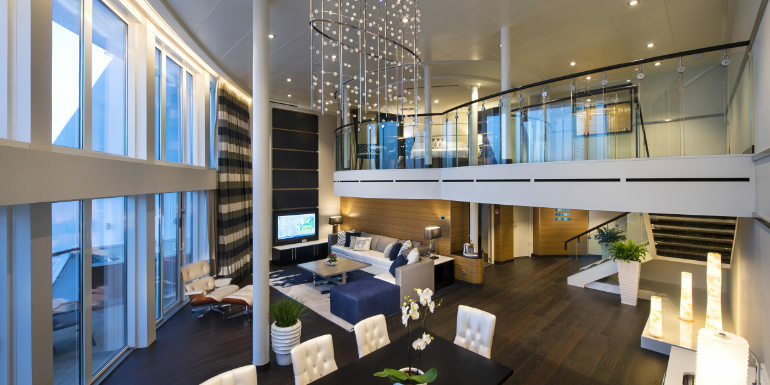 If that doesn't convince you to consider these knockout suites on Oasis-class and Quantum-class cruise ships, read on: a library, a dining room for eight, LCD TVs, a wet bar, another whirlpool in the master bath, king beds, walk-in closets and top-deck views. The décor reflects the ocean's hues and, combined with the windows and balcony, give the effect of being at one with the sea – if the sea were a palatial crash pad. Average cost: From $16,600 per person for a seven-night cruise. Break from the Disney characters for pampering in a Mediterranean-style, private spa, where not a single cartoon character lurks. Who knew a Disney cruise could be so, well, adult? Fantasy's Senses Spa Villa is a pleasurable oasis with private suites that feature a veranda, canopied Roman bed, whirlpool, open-air shower and luxe loungers. The Ultimate Indulgence package for couples includes all of the spa villa's amenities, plus added perks like an Elemis Pro-Collagen Marine Facial, choice of bathing ritual, and a deep-tissue massage. Mickey and Minnie never had it this good. Offered only a few times each season aboard Crystal Serenity and Crystal Symphony, these gastronomic events feature eight-course menus produced by guest master chefs, such as Chef Nobu Matsuhisa of eponymous sushi restaurants, Nobu, and Master Chef André Soltner, former chef of the now-shuttered Lutece in Manhattan. It's the wine list, however, that makes these dinners truly "ultimate." There's no repeating the choices, as these bottles are some of the world's rarest vintages. Featured wines have included a 1959 Château Lafite-Rothschild, a 1955 Graham's Vintage Port and a 1998. Krug Champagne Vintage Brut. Only 14 lucky cruisers may attend these rare and exclusive dinners. Average cost: From $1,000 per person (depending on the wine selection). Exclusive to Holland America's MS Nieuw Amsterdam, this gourmand's dream dinner by Master Chef Rudi Sodamin is a favorite among foodie cruisers. 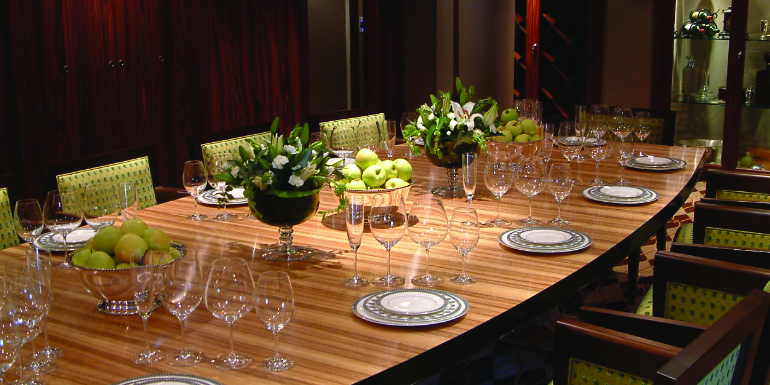 An intimate experience for 18 that fills up quickly, the seven-course hosted feast, preceded by champagne and hors d'oeuvres, takes place in a private room within the Pinnacle Grill. The table is communal and beautifully set with Frette linens and Versace china. Six wine pairings accompany such delectable dishes as black cod and caviar, veal chop with black truffles, and a dessert plate of artful chocolate concoctions. What's one big way you've splurged on a recent cruise? For ten more bucks, I'd rather do the Chef's Table concept on HAL that put up with another boring repeat performance put on by Carnival's minimally-creative chefs.